Electropolishing is an electrochemical process that yields a bright, smooth, non-corroding, super-clean finish. Deburrs all edges, leaving smooth surfaces. Uniformly removes molecular impurities, leaving a chromium-rich, non-corroding finish. Reduces friction and galling and extends the fatigue life of many machined and cast parts. Micro-sizes stainless steel parts, allowing ultra-precise component fitting. We process all kinds of stainless steel, as well as titanium, inconel, and other alloys. Components: marine, machined parts, casting, stamped parts, sheet metal, tubes, fittings, weldments, wire products, frames, tanks, more. 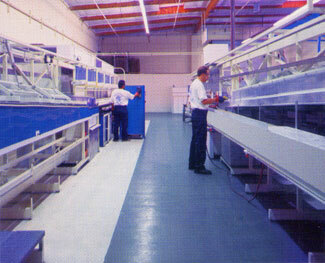 Our extensive experience in cleanroom-compatible manufacturing helps us meet the most demanding cleanliness standards. Ultra-smooth electropolished stainless steel bench tips, frames, wire shelving, storage enclosures, and other cleanroom furnishings wipe down clean and will not shed contaminants. 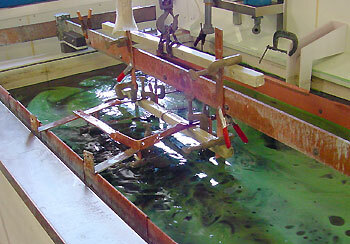 An anodic dissolution of metals is the basic mechanism for the electropolishing of metals. The component to be electropolished is connected to the positive end of a DC power supply while the negative lead is connected to cathode plates or matching tooling. The assembly is submerged in an electrolyte and current is allowed to flow, The actual process consists of an accelerated corrosion step that is controlled to obtain desired effects. The current approach to passivation is to complete the cleaning of the stainless components by doing the passivation step with nitric acid or citric acid; either step shall be in conformance to ASTM A967, QQ-P-35, MIL-S-5002. Nitric Acid: is used in completing the passivation of machined components and in post electropolishing operations. This step provides an effective means of removing all free iron from the surface of the finished part. The chemistry of the surface will be free of iron and all acid soluble impurities will be removed. Used as an alternative nitric acid, or in combination with nitric acid. Citric acid based chellation baths are used in a three step process to remove all impurities and to provide a surface that is compatible with biomedical applications. Oxygen service applications require that all components be free of organic residue and be in compliance with the specified standards. We can provide components per designation: G93-96. Standard practice for cleaning methods and cleanliness levels for materials and equipment used in oxygen-enriched environments.